Photo Credit: Toyota Canada Inc. The Canadian International AutoShow always features a lively and eclectic group of automobiles. This year’s show pledges to offer the greatest of 2016 cars, trucks, vans, crossovers, and almost any other class of passenger vehicle on four wheels. Some of the most engaging concept vehicles also arrive in Toronto every year as a firsthand opportunity for Canadians of the great city to chart what progress is upcoming for automobiles. Many times attendees of the Canadian show are the first in the country to witness the bold and high-tech future but we face the reality that we are not the first public members to examine such designs. Sometimes automakers even send concept vehicles that were first displayed several years ago to Toronto. Having brought the i-Road, FV2 Concept and the Fun-VII to previous iterations of the Canadian International AutoShow, Toyota will embark on a fairly uncommon vehicle. As much as their concept design is striking amongst itself, the vehicle significance comes with it making a global debut in Toronto. 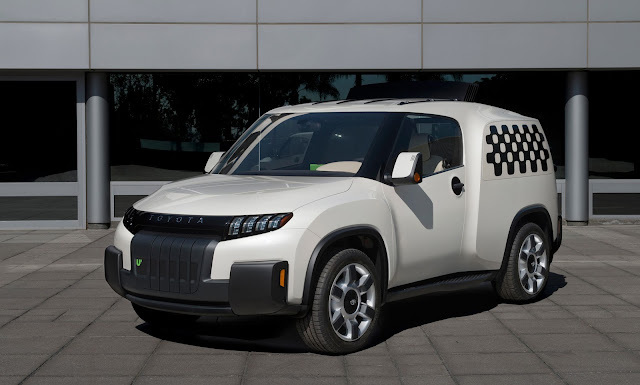 The Toyota U2 (or U Squared) will premiere at the 2016 Canadian International AutoShow as a truck-like mobile solution. Targeted towards entrepreneurs and so-called ‘Makers’, the Toyota U2 features unique utilitarian styling. A highly distinctive departure for Toyota, the outer shell of the concept has an offbeat urban flair. The grille and headlight treatment is among the unusual traits of the Toyota U2 since they share no resemblance to any other Toyota product produced in North America. The Toyota logo is substituted by lettering mirroring a characteristic style familiar to US and Canadian care buyers of the Japanese brand up to the 1990s. Dubbed as an urban utility concept, the Toyota U2 will showcase an unhinged flexibility inside. “From its retracting roof panels, to its uniquely configurable utility rail system, the U2 offers a concept vehicle that is only limited by the imagination,” said vice president of sales for Toyota Canada Inc. Cyril Dimitris. More details of the Toyota U2 concept will be present later this week as the 2016 Canadian International AutoShow is set to entertain an anxious automotive crowd. In addition to the U2, the Toyota exhibit will also feature the all-new 2016 Toyota Prius, RAV4 Hybrid and virtual reality simulators.